An active approach to design speed, sometimes called the safe system method, uses speed as an output affected by geometric design rather than an input alone. The Safe System Approach acknowledges that human error is inevitable, but by reducing speeds to under 30 km/hour, drivers have more time to react and cause less bodily harm during crashes. NSW Centre for Road Safety. “Safe System” — The Key to Managing Road Safety. Roads and Traffic Authority, New South Wales Government, AU (2011). By setting a target speed for transit and general motorized traffic, designers can proactively create a safe walking and riding environment. Human context is the primary determinant of safe vehicle speeds on any street. When designed for an appropriate speed, a street can both accommodate prevailing transit speeds, create a safe operating environment for transit, and provide a safe, comfortable street for people walking and bicycling to transit. Speed limits are not the primary factor in urban travel time, especially when buses and streetcars operate in mixed traffic. Reducing speed limits may not have a measurable impact on transit performance, and may be beneficial where transit speeds are much lower than the pre-existing speed limit. 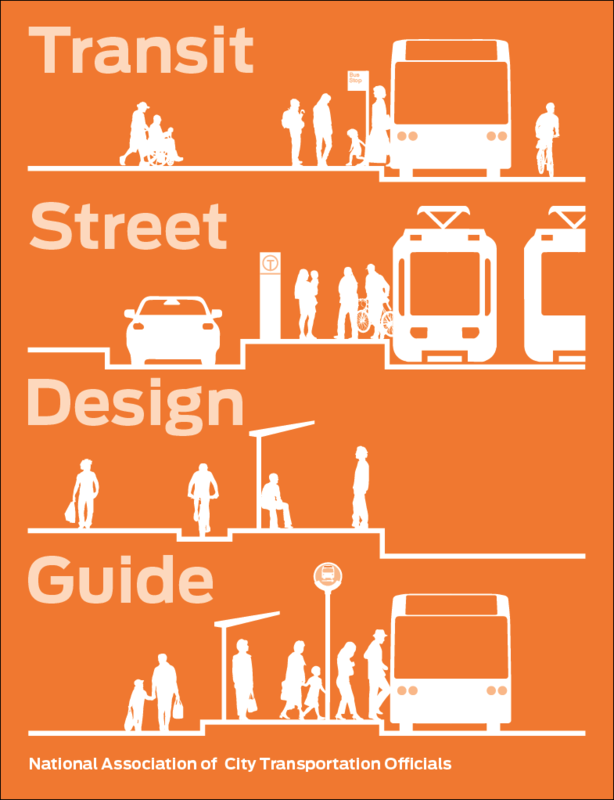 Desired vehicle speed can be achieved through proactive street design that encourages safe speeds, keeping to a minimum the total number of general through-traffic lanes, choosing a small corner radius, and providing a full urban streetscape, including trees and street furnishings (refer to the Urban Street Design Guide for more guidance). Stopping distance is substantially longer for rail vehicles than buses. While most urban conditions require frequent stopping and low speeds for on-street routes, transitways may have higher speeds and may require longer stopping sight distance. Immediately before a stop, shorter transition distances are acceptable for transit vehicles since deceleration has already begun. Design streets using target speed, a safe speed at which drivers should drive, rather than existing operating speed or statutory limit. Align the design speed with target speed by implementing traffic calming measures, including narrower lane widths, roadside landscaping, speed cushions, and curb extensions. Traffic calming measures can be designed to slow general traffic while having little negative impact on transit vehicle operation. Reducing speed dispersion confers a transit benefit by making traffic flow more predictable. In mixed-traffic operations, it is desirable for the 95th percentile of observed target speeds to fall within 5 mph of top transit speeds. In selecting the design speed basis for such values as signal progression speed, lane width, and transition taper length, it may be appropriate to choose a speed lower than the speed limit, unless the limit can be lowered locally to the desired design speed. Using the full speed limit to calculate taper lengths, for example, can result in lane transitions occupying most of a city block, even though a less gradual transition self-enforces a safe design speed. Where space is not highly constrained, it is desirable to provide longer (more gradual) horizontal and vertical transitions for transit vehicles, providing improved passenger comfort. Use standard lane widths to encourage safe operating speeds. In-lane stops in mixed-travel lanes— which often utilize boarding bulbs and islands and stabilize operating speeds by reducing the need for transit vehicles to shift lanes—should be implemented where feasible (see Stop Placement & Intersection Configuration). Reducing design speed using lower signal progression speeds can confer benefits to transit performance while improving safety for vulnerable users, especially in downtown contexts with closely spaced signals, or where dwell times are low but stops are frequent. Shared transit streets may be assigned target speeds as low as 5–10 mph. At these speeds, rail vehicles or buses can operate safely in a traveled way shared by people walking. Speed enforcement cameras have proven highly effective at reducing speeds and improving speed limit compliance by private motor vehicle drivers. A speed camera program in Montgomery County, VA, yielded a 10% reduction in mean speeds and a 59% reduction in the likelihood that a vehicle was traveling more than 10 mph above the speed limit at camera sites over seven years. Wen Hu and Anne T. McCartt. Effects of Automated Speed Enforcement in Montgomery County, Maryland, on Vehicle Speeds, Public Opinion, and Crashes. Insurance Institute for Highway Safety, (2015).